The T100’s average specs may not impress, but its 11 hour battery life will. At yesterday’s Intel Developer Conference (IDF) in San Francisco, Asus chairman Jonney Shih showed off his company’s budget-friendly T100 transforming tablet. The Taiwanese hardware manufacturer hopes to disrupt the mobile computing market by offering the Windows 8.1-powered hybrid for a mere $349. The T100 comes with a 10.1-inch IPS display with 1366 x 768 pixels. Beneath the screen is a quad-core Intel Atom Z3740 “Bay Trail” CPU rated at 1.33 GHz (max turbo is 1.86 GHz). The GPU is listed as Intel HD Graphics, but the exact version isn’t specified. The T100 has 2GB of RAM and storage options of 32GB or 64GB (the larger option costs $399). Storage can be increased via the T100’s microSD reader. Other ports include micro USB for charging (and connecting external USB-powered devices), a micro HDMI output, and a headphone jack. The included keyboard dock also adds a USB 3.0 slot. The T100’s tablet section measures 10.4 inches x 6.7 inches and is only 0.41 inches thick. Considering that the 32GB version is only $349 with a keyboard – the Asus T100 undercuts the Microsoft Surface by $80 (the cost of the bought-separately Touch Cover keyboard). The new Transformer’s specs and build quality may sit comfortably in the budget range, but the battery offers undeniably high-end performance. 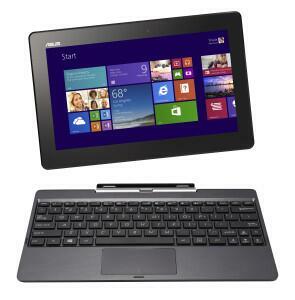 Asus’ budget hybrid will launch on October 18 – the same day as the general release of Windows 8.1.